Major infant brain growth occurs during pregnancy and throughout the first two years of life. During these times, infants and toddlers have the greatest need for Docosahexaenoic Acid (DHA). DHA is an omega-3 fatty acid and a building block for the brain. Since 85% of brain growth happens within the first three years of a child’s life, it is important to maintain the recommended levels of DHA through the toddler years. On average, toddlers are only getting about 25% of the brain-nourishing DHA many experts recommend so it is important that parents provide them a diet that includes adequate amounts to bridge this gap. It can be trial and error to close this nutrition gap. Food options naturally containing DHA are limited because DHA is mostly found in foods such as fatty fishes which, if your toddler is anything like mine, they don’t eat. Click HERE to learn more about the benefits of DHA in your toddler’s diet. Thankfully, there are convenient products like Enfagrow Toddler that help make it easy to make sure your child is getting DHA in their everyday diet. Enfagrow Toddler makes drinks that have DHA. They are nutritionally designed for one to three year olds and to complement a toddler’s regular diet. Enfagrow not only has DHA, it also has important nutrients like calcium, vitamin D and iron for healthy growth, and a prebiotics blend designed to help support digestive health in just two servings a day. Enfagrow is sold in a powder or ready-to-drink varieties. Although I have been buying my daughter Enfagrow since she weaned from breastmilk at 14 months, we recently had the opportunity to try out some of their new products. We usually buy the convenient ready-to-drink boxes because they are so easy when we are on the go, but we were sent one Toddler Transitions can and one Toddler Next Step Natural Milk Flavor can, which she had never tried before. My daughter has always enjoyed drinking Enfagrow since it was first introduced into her diet. My daughter has been just wanting whole grain chicken nuggets, green beans, turkey spaghetti, hummus, and yogurt these days. And with this change in diet, substituting with Enfagrow has made me feel better knowing that she is getting the nutrients she needs to grow into the strong, healthy, beautiful, and smart little girl she is becoming. Why do you think DHA is important? Why do you want to try Enfagrow? What does your child eat that makes you look for substitutions? NO PURCHASE OR PAYMENT NECESSARY TO ENTER OR WIN. A PURCHASE WILL NOT INCREASE YOUR CHANCES OF WINNING. LEGAL RESIDENTS OF THE 50 UNITED STATES AND D.C. 18 YEARS AND OLDER ARE WHO ALREADY HAVE INTERNET ACCESS AND VALID E-MAIL ADDRESSES ARE ELIGIBLE TO PARTICIPATE. VOID WHERE PROHIBITED. Promotion begins 9/8/2014 at 12:00 AM PST and ends at 11:59 PM PST on 9/24/2014. Odds of winning depend on the number of eligible entries received. Official Rules, eligibility, prize descriptions and odds disclosure are available at http://www.thesitsgirls.com/sweepstakes-official-rules/. Sponsor: Mead Johnson & Company, LLC, 2400 West Lloyd Expressway, Evansville, IN 47721. I had no idea they made single servings. I would love to try toddler Enfagrow! My 3 year old has profound special needs, and currently drinks Pediasure to get enough calories. I had used Enfamil Next Step (which is what I guess Enfagrow is now) with my oldest. She was so picky and I wanted to make sure she was getting all her needed nutrients! I never even thought to use this for my toddler since she's not a picky eater. I bet she would love it since it comes in single servings too. This is great! They didn't have this for my Kiddies but I did take an extra DHA supplement while nursing them and while pregnant. How interesting! I feel like I've been to school today and it's not even 8 a.m. Thanks for the valuable information on DHA. Don't enter me, as my kids are all older -- but this was very interesting. i'd love for my daughter to try it b/c she's about to transition from breastmilk/formula in less than a month! Wow, you hear about these things, but you never really know until you read, learn and research them on your own. Thank you for sharing! I don't currently have a child this age but I remember hearing all about this when my kids were little. DHA is so important for brain development and is such a great thing for the kiddos! These weren't around when my kids were younger! How convenient to have the single servings. DHA is especially important for brain development. 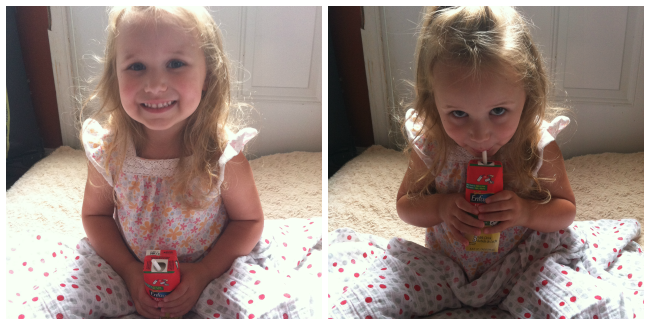 My 4 and 2 year old both love the ready-to-drink boxes too! Thanks for sharing this! I take DHA right now while I'm pregnant and I plan to continue to take it while I'm breastfeeding. I'll definitely keep this in mind once he becomes a toddler! Thanks for sharing some useful information. I'm sure that a lot of moms out there will be very happy to know the facts you shared. Brain development is very important and giving kids the nutrients they need during this crucial time of their growth would help a lot. Thank you! My baby is only 5 months and breastfed so I take vitamins with dha, I wasn't aware she would need dha when she weans! DHA is important for proper brain development. I want for our granddaughter to try Enfagrow so she has the nutrition she needs. When she soon stops using formula, we would replace it with Enfagrow as a beverage. I GUESS I DID THE RIGHT THING WHEN MY DAUGHTER WAS LITTLE. BEING A PICKY EATER I KEPT HER ON A FORMULA MIX FOR LONGER THAN I SHOULD HAVE BECAUSE OF HER NOT GETTING THE RIGHT NUTRITION FROM FOOD SHE WOULD NOT EAT. I CONTINUE MIXING FORMULA WITH HER MILK TILL SHE WAS ABOUT 3 & FINALLY WOULD EAT MORE FOOD. DHA WAS JUST BEING TALKED ABOUT AT THAT TIME BUT I KNEW AS A MOTHER SHE WOULD NOT GET ENOUGH JUST FROM COWS MILK. I know DHA is important for brain development. I would love to try Enfagrow so I feel better about my daughter getting the nutrients she needs everyday. For the last few days, all she wants to eat is yogurt and grapes. Sometimes it makes you feel like an awful mom for giving the kids something like that for dinner (although I suppose there are worse things I could feed her), but knowing she got some of the things she needs after drinking Enfagrow would definitely give me some peace of mind. 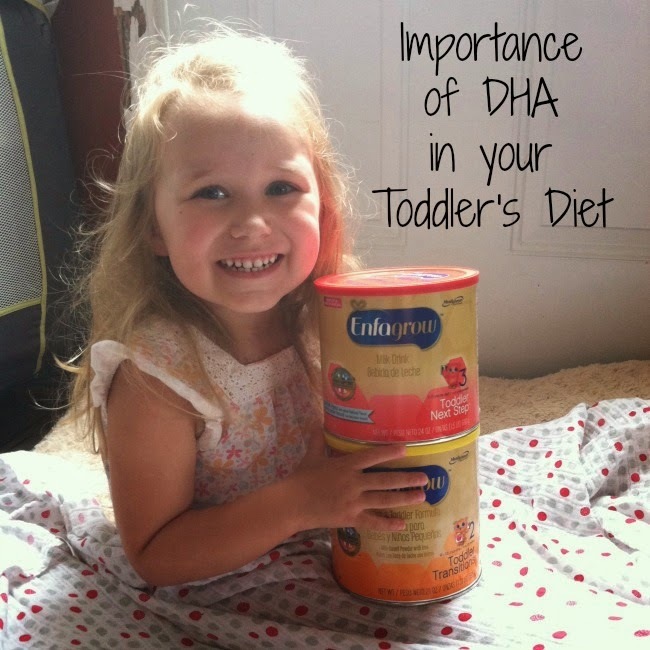 i think that DHA is important because it ensures my daughters brain is developing properly! I want to try Enfagrow since she is a super picky eater and this would ensure she gets all of her daily nutrition! My child loves to eat yogurt.. cheese and cold cuts! She is so picky right now!! I would love to have my son try Enfagrow line because they have vitamins, minerals, and brain-nourishing DHA, to help fill in the gaps in my toddler’s nutrition. Picky eater as far as textures, won't drink any milk except breast milk. I have a difficult time getting my toddler to eat much and I worry about her nutrition.